Farce the Music: Breaking News! 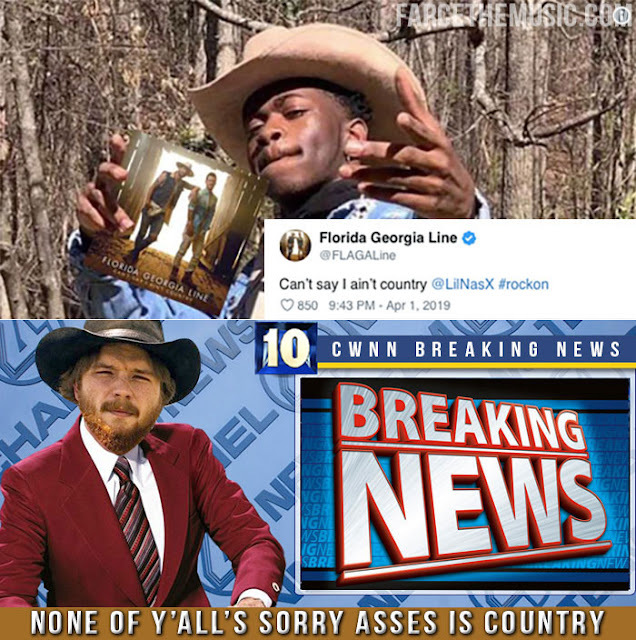 And you consider this soy boy to be "traditional country music"? All the non-country sounds and acts infesting mainstream country radio today, as well as the fact that pop star Bebe Rexha holds the title for the longest running number one country song at 50 weeks while Lil Nas X has not only been able to go viral with “Old Town Road” but has also had it chart on the country charts, are simply the apocalyptic aftermath of what Alan Jackson (the Nickelback of country music) did to country music. In light of this craze about “Old Town Road”, I have to reiterate my point that Alan Jackson did to country music what Bush did to Iraq and Obama did to Libya.